Access the Bradley Revit Library from the top of the BradleyCorp.com Website. 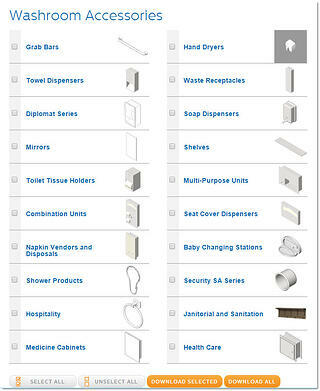 The Bradley Washroom Accessories Revit Library is the biggest Revit family category in the Bradley Revit Family Library (1,000 Revit Families) -- representing thousands of Bradley Washroom Accessory Product configurations. 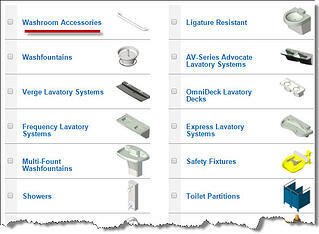 Download the Bradley Washroom Accessories Revit families from the main Revit Library page --OR Select All or portions of the accessories library. Next pick "Download Selected". 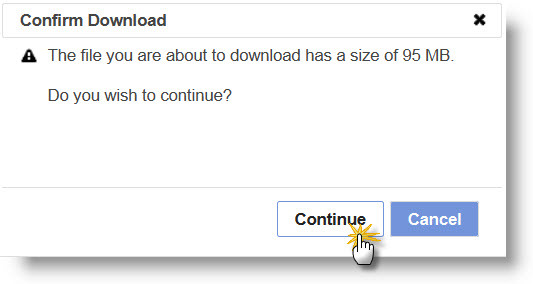 The "Confirm Download" dialogue box provides the Zip File size and requires that you select "Continue" to confirm the download. After selecting "Continue", a FILE dialogue box pops up; for you to select the folder location to download the Zip file. Dispensers & Vendors: Soap, Paper Towels, Toilet Paper, Sanitary Napkin, etc. 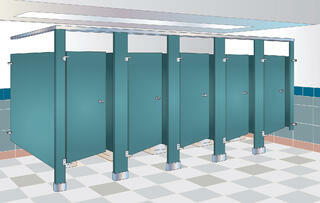 Remember --Bradley has a complete line (30+ Revit families) of Revit Toilet Partitions to host your Revit Washroom Accessories.